I believe most of you, including the adults, would have enjoyed the animated movie, “Shrek.” I know I did. It’s a clever deconstructive parody of fairy tales – where the monster, the ogre “Shrek”, is the protagonist hero. But that was not the only twist in the story. As the story built up to its climatic ending with the audience cheering on our hero to free the love of his life, the beautiful princess Fiona from her curse, we are treated to one last surprise ending. Perhaps, it wasn’t a surprise after all. When Fiona was finally freed from the curse, she was depicted as ascending into the air in a rain of glimmering lights (a parody of the Assumption of Our Lady, like one of Murillo’s paintings of the Immaculate Conception), she is suddenly transformed! One would be expecting a beautiful princess. But no such luck! Instead, she remains an ogre and, we are assured, will continue to remain an ogre for the rest of her life. The spell has been broken and she has become what she truly is. Beautifully Ugly! Ugly is the New Beauty. The argument put forward for this movie and so many others, is that we live in a real world, not a fairy tale realm of perfect individuals, of clear lines dividing the good and bad, but a world that is inherently ugly, violent and broken. In fact, we are constantly bombarded with the message to embrace this world and all its foibles. “Face it, there’s no other option. So, you better learn to live with it!” So we begin to treat black as white, evil as good, monsters as angels, and villains as the good guys. But the old fairy tales are claiming the exact opposite; that what everyone knows in his heart to be true, that there are such things as goodness and beauty and truth – and even though in this life they are obscured or hidden altogether, a time will come when the truth will be revealed, when dragons will be slain, bewitched captives will be set free and Ugly Ducklings will be revealed as beautiful swans. Yes, we must embrace ugliness, hatred and lies in the sense that they are part of our fallen world and our fallen selves; but when we embrace them, we should do so with a view to the good end, that is to come. There is something universally true about the happy ending to fairy-tales and traditional stories. They all point us in the direction of human aspiration where we hope that our most insurmountable problems would find a solution, where suffering would finally be alleviated once and for all, where the horrors of injustice will be righted, where the clutches of sin would be broken and its captives set free. The good news is that the beautiful happily-ever-after ending is something real and not just part of a fairy tale. The feast the Church celebrates today affirms this truth. The Immaculate Conception is no mere abstract dogma, but a concrete actual truth of fact, lived and realised in the life of a person of flesh and blood, like ourselves, the Blessed Virgin Mary. The ugly taint of Original sin has not marred or disfigured her beauty. She reveals to us the truth that we are God’s greatest masterpiece in His created universe. Mary shows us our true vocation and God’s original plan for us. As Pope Pius IX says in his encyclical solemnly defining the doctrine for Catholics, Ineffabilis Deus, “The absence of any stain or spot of sin distinguished her from all the rest of mankind. It distinguished her from the holiest of the Saints, since they, one and all, were sinners. Her perfect sinlessness was the source of all her glory and all her majesty; it was this which opened the door to the unlimited graces that she received from God; it was this that qualified her for her divine maternity and raised her to the throne as Queen of heaven.” What is said of our Lady can be ascribed to our original state. We were not meant to be ugly ogres; that is the result of the Fall, the consequence of sin. Sin defiles and distorts beauty, the good and truth. Created by Grace and infused by Grace, we were meant to be exceedingly beautiful. One of the basic lessons I taught our altar servers has to do with the appreciation of beauty. It’s not just a lesson in aesthetics but a lesson in salvation. I told them, “Ugliness is of the devil and Beauty is of God.” We could easily substitute the word ‘beauty’ with ‘God’ or ‘holiness.’ This is because the God we worship, is a God who is the embodiment of Truth, Goodness and Beauty. For the wicked, God’s holiness is revolting. Ironically, the wicked seem to delight in the ugly. For the righteous, the great works of redemption and sanctification bring true spiritual delight to the holy. The righteous are naturally drawn to the beautiful. Since man’s contemplation of the beautiful is ultimately a contemplation of God, then his desire for beauty is ultimately a hunger for holiness, a life in union with God. Thus, my simple advice to our young altar servers is always to aspire for the beautiful, for the true, for the good, for then, they would be aspiring to be united with God. Few realise that our environment has a great power to shape us. Beauty is transformative. C.S. Lewis, describes it this way, “We want something else which can hardly be put into words — to be united with the beauty we see, to pass into it, to receive it into ourselves, to bathe in it, to become part of it.” If we expose ourselves to truly beautiful places, truly beautiful objects, truly beautiful churches, truly beautiful liturgy, and truly beautiful people, we desire to become beautiful ourselves because beauty awakens our desires for the higher and nobler things of life. But if we expose ourselves to places, things, or people that are devoid of beauty, our taste for the higher and nobler things of life is dulled and corrupted, and we begin to accept a life without beauty. In fact, over time we can lose our ability to recognise beauty when we see it—especially the beauty of moral goodness in the saints. And it is then that we lose hope. Admittedly, unlike the Blessed Virgin Mary, we are not preserved from Original Sin or any sin for that matter. We continue to struggle with the imprisoning and deforming qualities of evil and sin. But, the Church our Mother offers us the path of sanctification. We may not be conceived sinless like the Blessed Virgin Mary, but we hope one day, to be freed from sin like her. This is not just a fairy tale. This is real. Our primary work in this life is to become holy, to become beautiful, good and truthful. This is the way of sanctification. Again, sanctification is more than saying “no” to sin. It is more than just the rejection of ugliness and all its lies. Sanctification means saying “yes” to holiness, saying “yes” to beauty, to the good, to the Truth and joyfully submitting to the will of the Father. Sanctification means saying “yes” to a loving God and what He loves. St. Augustine was correct when he wrote that “beauty is the splendour of truth”. The truth about us is that we are made both good and beautiful but that we have lost our original beauty and goodness. And the greater truth is that we will be restored someday to our original “princess” beauty; ugliness was not our ultimate origin, nor will it be our final destination. 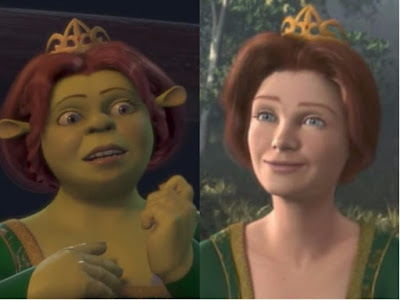 Unlike the ending to the movie “Shrek”, we will not ascend like the princess Fiona to become an ugly ogress, but our bodies would be transformed, transfigured into the glorious bodies that we were meant to be. We are not meant to be ugly worms but glorious butterflies. It would take the redemptive ugliness of the cross to bridge the gap between our beginning and our end. Ugliness (like lies and evil) makes no demands on us; rather, it invites us to sink lower into the mud and mire. The good, the true and the beautiful, on the other hand, invites us to take a glance backward and then trudge on with hope toward the distant land which is our true home.